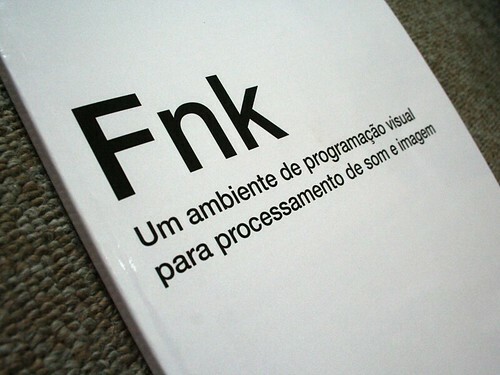 Last Wednesday, I finally delivered my thesis’ final copy to college (there’s a PDF version here, but it’s in Brazilian Portuguese only – I’m translating it, but that will take time). It starts by describing the project’s context and goals, then it explains its development and execution methodology, and finishes with my assessment on how successful the project was on a technical level, as well as a list of features that were not implemented and that should be taken into account in the next reviews of the program. That doesn’t mean I’m done with the college assignments, though. I will still have to present it to a board of teachers somewhere around the coming days, to give a better explanation of the project as a whole and to defend some of its goals and methodology. It doesn’t mean my work in Fnk is over, either. While I think it’s a good start, there’s plenty of features I still want to add to it, and my to-do list right now is bigger than ever. Its development will be a bit slower from now on, however – I have to do actual work, after all, as I was enjoying a kind of a sabbatical period to work exclusively on it for the past two months and I can’t keep that up forever. Regardless, I think it has a bright future. In the meantime, thanks for everybody who sent suggestions and helped me test the software. That’s more or less the idea. I won’t make it OS yet because, quite frankly, the internal structure is a mess and there’s a lot I want to change specially regarding how a Patch works with its visual representation – I need to add more events and make things less hard-coded. The way I did things was highly experimental for me, it’s working but there’s a lot of room for improvement. Node types in theory are easy to add – I did it a way that’s pretty dynamic, even the help patch is self-contained, so by loading an SWC that contains classes that extend the original node class, using additional node “libraries” should be easy.. but this is also part of something I’ll have to decide on the future. Man I’ve been waiting for something like this for AGES.. especially as a tool on learning how to code – by patching.. have a window tracing the output or something..
Maybe have a PATCH (view) for all the as3 code out there… people might pay? for such a tool..